Full Circle Health Care acknowledged that it stopped paying monthly fees to CompuGroup, in part because of disputed billings. When staffers at a ti1ny medical practice in far-northern Maine arrived at work one July morning and tried to view medical records for that day’s patients, they got an unsettling response from their computer. The staff called a technician, who confirmed what had happened. As part of a billing dispute, the vendor for the clinic’s electronic health records — a German corporation with US headquarters in Boston — took the unusual step of blocking the staff’s ability to look up medical histories on its 4,000 patients. Nurses and physicians could no longer use the system to review diabetes records, blood pressure logs, medication histories, allergy reports, lab results. Nothing. The company’s aggressive action poses what specialists in the field of digital health records say is a serious safety hazard for patients. 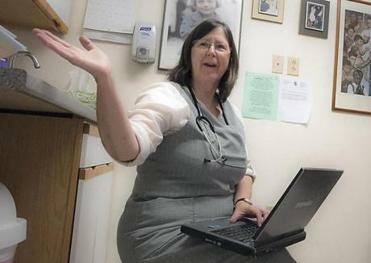 Victoria Glover in an exam room at Full Circle Health Care in Presque Isle, Maine. But the German health technology company, called CompuGroup, likens the situation to a utility customer who stops paying bills, saying a medical provider should similarly expect its medical records to go dark. A couple of weeks after the July morning when the records were shut down, a CompuGroup lawyer at its US headquarters in Boston delivered an ultimatum, via e-mail: Until the medical office, Full Circle Health Care, paid $20,000 in overdue charges, the electronic health records would remain locked. “I’m incredulous they think it is OK to hold us hostage like that,’’ said E. Victoria Grover, the physician assistant who owns and operates Full Circle. The financially struggling practice, with about 10 employees, is located in Presque Isle, a city that has its own hospital but is located in a rural region that lacks easy access to medical care. Grover acknowledged that Full Circle stopped paying CompuGroup $2,000 monthly fees about 10 months before the shutoff. But she said that was after months of fruitless haggling over what she considered exorbitant, unexpected maintenance fees and charges for hardware that was never delivered — disputed billings that she said CompuGroup refused to acknowledge or correct. This year she hired another electronic health records vendor, but her practice’s old records, the ones controlled by CompuGroup, hold important patient information that is vital for making treatment decisions. That information remains inaccessible on her old servers in a closet in her office and can’t be moved onto the new system. “I’m pretty desperate to get these records back,’’ Grover said. This David-and-Goliath battle, pitting a tiny medical office and a German multinational corporation, may have broader implications. Physician practices and hospitals across the country rushed to cash in on $30 billion in federal subsidies for electronic health records systems starting in 2009, including Full Circle. As contracts were inked by the thousands in the last few years, say legal experts, not enough thought was always given to what happens when the computer systems stop working correctly, vendors or providers struggle financially or go out of business, or the parties have a falling out. The Presque Isle situation represents the worst-case scenario, with thousands of patients and their doctors finding their records stuck in a digital limbo, the subject of a hostile dispute. Since the July 30 shutdown of records at Full Circle, the staff has been scrambling each time a patient schedules a visit. 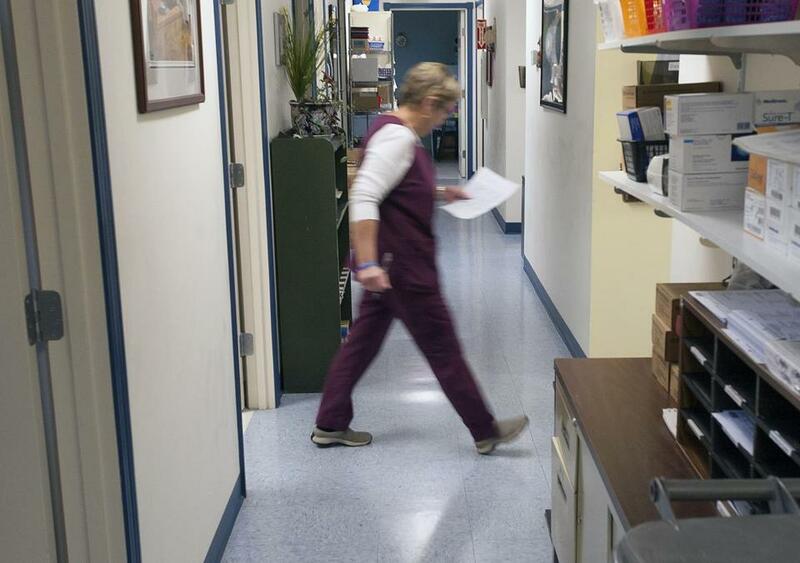 Nurses hunt down separate pharmacy and lab reports to piece together what care has previously been provided. Still stuck in Full Circle’s computer servers are doctor’s notes about each patient visit, the crucial narratives that document the patient’s condition and medical history. Other providers in Presque Isle expressed concern about Full Circle’s predicament, without commenting on the billing dispute at the core of the fight. One of the key reasons to computerize patient records is to allow them to be exchanged among state or local networks, such as Maine’s HealthInfoNet. “If you were to stop paying your electricity bill, and a year later someone shut down your electricity, how would you feel about that?’’ said Tetyana Buescher, general counsel of CompuGroup Medical USA. Buescher declined to say how often CompuGroup had shut down records of its customers for nonpayment. It is not clear what legal recourse Full Circle, which contacted the Globe to tell its story, has to pry open the records. The medical office has not filed a lawsuit. Reports of similar cases are rare. A 2013 lawsuit in Wisconsin was settled after a federal judge denied a temporary restraining order sought by Milwaukee Health Services against its Atlanta-based vendor. The judge expressed little sympathy for the medical practice in the decision denying the restraining order and said the medical group could unfreeze the records by simply paying its disputed bill. In Presque Isle, Full Circle first obtained its electronic medical record system in 2010 from a Georgia company called HealthPort. The price was $72,000 for the up-front costs including HealthPort’s software and hardware. Maintenance fees in the original contract were set at what worked out to be about $300 a month. CompuGroup Medical purchased HealthPort’s electronic record business for $18 million months later. Grover said CompuGroup soon began charging maintenance fees of $2,000 a month. The original HealthPort contract, reviewed by the Globe, says that Full Circle owns a copy of the HealthPort electronic health record software. But the contract also says that if the software works in conjunction with the vendor’s off-site application systems, then the vendor has continued authority over its use. Now Full Circle wants just 48 hours of access so it can move all of its patient data to its new system, “and CompuGroup’s logo would never cross our screens again,’’ Grover said. But, she said, she sees no clear path to that resolution.